Fairfax County car owners may soon be able to buy a special Virginia license plate to show some pride in where they live and raise money for a big sporting event. WASHINGTON – Fairfax County car owners may soon be able to buy a special Virginia license plate to show some pride in where they live and raise money for a big sporting event. The county has approved the design for the plates. Board of Supervisors Chairwoman Sharon Bulova says all they need now is a minimum of 350 people to sign up for them. If they sell at least 1,000 license plates, the county will get $15 out of the $25 state fee. “That revenue would be used to help, at least in the early years, to support the World Police and Fire Games, which will come to Fairfax County in 2015,” says Bulova. Commemorative license plates are not new to Virginia. One of the more popular ones highlights the 400th Anniversary of Jamestown. 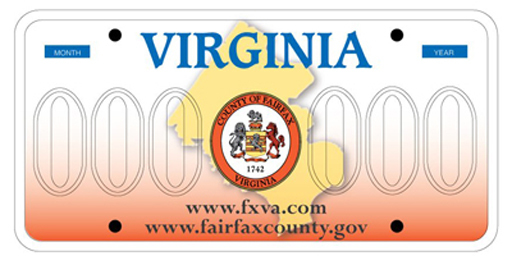 The Fairfax County plates, which are orange and cream in color, would include the county seal, the county’s website and the website for visiting Fairfax.